It’s Occasion where the Palestinian people in the occupied territories of Palestine and out of Palestine assure their commitments and determination of struggle till the liberation and return to build their own country Palestine with freedom, peace, just. The Place: Children & Youth Centre – CYC Shatila Camp. Two day ago it has rained, they didn’t have place to hide them selves at the middle of night, everything became wet, the few blankets and mattresses and themselves… The volunteers who rush to help couldn’t do anything,,, when we thought to move at least the children and women to their homes until morning,, the surprise was that many of them have no houses to go to… At morning some of them got sick and pain especially the children and the old ones whom already sick… Few children and old mothers were Lucky to protect them in 3 volunteers cars and a small mini Bus… while the rest remain under the rain. First was a child in very bad situation after they found a Rat eating his foot. Second, a child fall and got bad injury in the head. The refugees are suffering out of the high living costs in Lebanon, while they have lost everything in Syria, in addition to the fact that they are threatened to be thrown on the street. Of course, we do understand and support their loud voice out of their pain and we do believe they should benefit from what the Child Rights, Human Rights, and Refugee Rights treaties call for in order for them to survive, with dignity and respect. We do believe this situation will carry a huge threat to the children’s safety and protection from delinquency, child labor, drop out of schools, moral and physical abuse and exploitation. CYC is standing beside this popular strike, and supporting their action, as well as calling for all who can give a hand to them to not hesitate. Therefore, whatever you can provide can be of big help to them. We consider their strike supportive to all the NGO’s demanding for emergency and relief work for the refugees. The Refugees stopped believing the excuses of the donors. such like lack of acknowledge, or they work on need assessment, or waiting the answers for their appeals. The refugees believe that the government’s concern is directed to support mainly the military groups and gang who are involved in the war in Syria, and not planning to support civilians whom are left without protection and support. 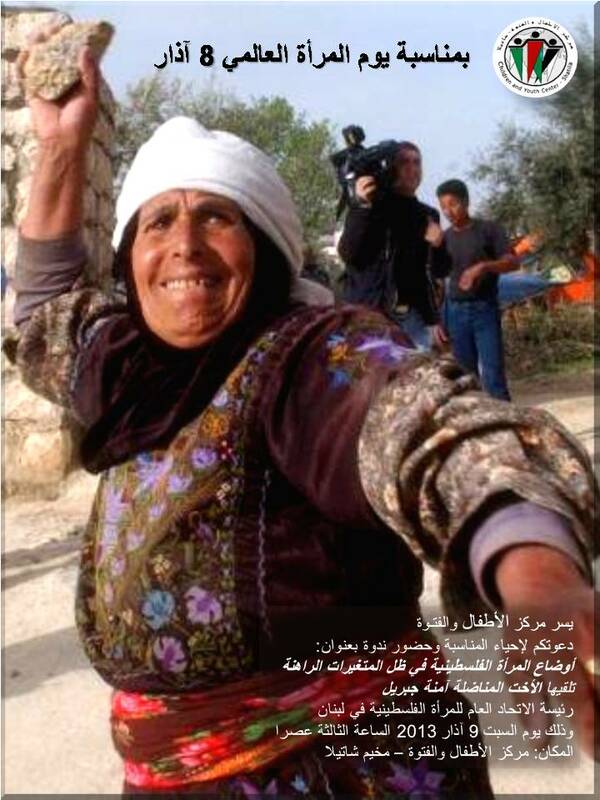 Ms. Amneh Jebril Has greeted the women struggle in the world, especially in Palestine under the occupation for the freedom, just, independent and sovereignty… She has has mention to glory position of the Palestinian women and men in the Israel occupation Jail, where they are presenting a heroic stead feet. Ms. Amneh mention for the Palestinian woman in the camps if Syria, who is facing the fire, destruction and death,,, which obliged thousands to escape to other countries. 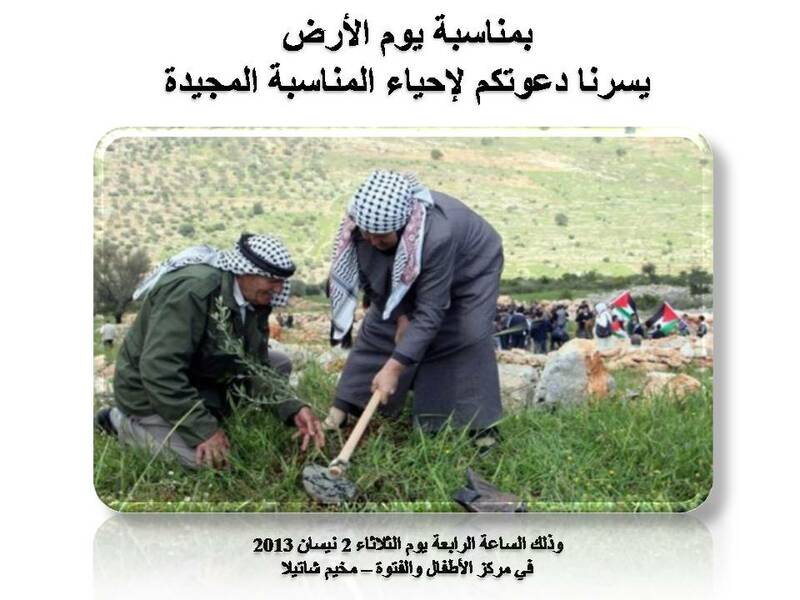 The Palestinian people in spite of all the Occupation aggression, and oppression still determine to hold their rights and struggle by their live flesh and through popular resistance to stop all the Zionist policies, steeling the lands, destroying houses, uprooted Olive trees and settlement. and the Racism discrimination wall. Israel is carrying the responsibility on the safety and lives of the prisoners. mainly who are in Hunger strike. Judging Israel for its crime of killing the detainee Arafat Jaradat.. Speeding the reconstruction of Nahr El Bared camp..